We’d love your help. Let us know what’s wrong with this preview of The Color of Darkness by Andrew Knight. Her name is Nova, like the muscle car, or a supernova, and she is a cosmic hurricane in Puck's world. She swears, drinks, lives among the stars, and he can't help but fall hopelessly in love with her. Is it love? Infatuation? Enamoration? He's not sure if he'll ever find out. He is sure, however, that the only thing that can und Irrepressible. 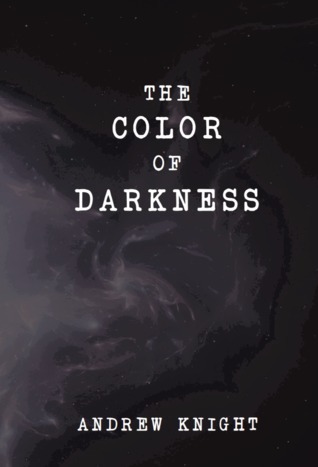 To ask other readers questions about The Color of Darkness, please sign up. This book follows three friends. Ricky, Andy and Nova. Andy and Nova in particular come from difficult backgrounds and so when they start to fall in love with each other, there are a lot o It’s honestly so rare nowadays that you will come across a young adult book that just feels so much like poetry and literature that you can’t help but be drawn into the lull of the beautifully complicated words and the simple story line that is made elaborate by the silky words woven between the paragraphs. I won't give this a five yet because I've been reading the version on Wattpad (I assume it's not the final draft), but man. When I read the first page, the characters jumped off of it. It was real to a point that I've rarely seen in fiction (first thing that comes to mind is The Kite Runner, so that's pretty damn high praise). I can't wait to pick up the physical copy soon because this is book deserves rereading. There is no other way to explain how great this book was to me. No such words that I could think of.